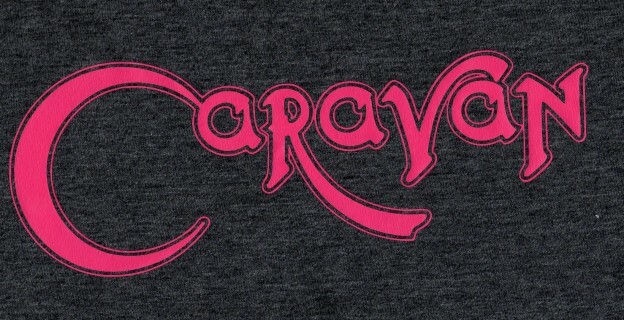 There are two designs and 4 colours and both are Caravan logos from the mid 70’s. We have produced a limited edition dark grey and pink Caravan T-shirt, which will be available to pre-order in sizes medium to XXL. These will take around 2 weeks to deliver as they will be produced to order. The black, light grey and white t-shirts are in stock. These sold out on the last three gigs so we now have new stock. This entry was posted in Merchandise and tagged T-shirt on February 21, 2015 by caravan. This entry was posted in Merchandise and tagged Polo shirt, T-shirt on August 20, 2012 by caravan. This entry was posted in CD, Merchandise and tagged Shepherds Bush on March 15, 2012 by caravan. This entry was posted in CD, Merchandise and tagged 2011, European Tour, Shepherds Bush, T-shirt on November 20, 2011 by caravan. 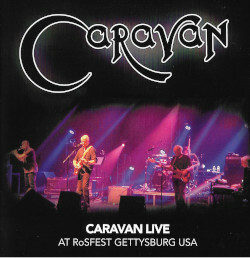 This entry was posted in CD, Merchandise and tagged 2011, Concert Live, Shepherds Bush on October 9, 2011 by caravan. This entry was posted in Gigs, Merchandise, News, Tours and tagged 2011 on October 5, 2011 by caravan. ‘In The Land of Grey and Pink’ is now available at you local retailer and online. 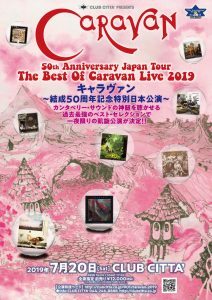 To celebrate the fortieth anniversary of the release of Caravan’s In The Land Of Grey And Pink Universal is pleased to announce a special three-disc deluxe edition of the album. The original multi-track session and album masters have been revisited by Steven Wilson (of Porcupine Tree and Blackfield) who has prepared new stereo and 5.1 Surround Sound mixes. Disc One features the original album newly remastered by Paschal Byrne at The Audio Archive plus three new Stereo mixes by Steven Wilson. Disc Two features two previously unreleased versions of “It Doesn’t Take A Lot” and “Nigel Blows A Tune” plus four non-album tracks remixed by Wilson Disc two also includes three songs recorded live for BBC radio’s Sounds of the Seventies – “Love To Love You” “Love Song Without Flute” and “In The Land Of Grey And Pink” plus two songs recorded live for John Peel’s Sunday Concert which included a superb cover version of Soft Machine’s “Feelin’ Reelin’ Squealin’” and Caravan’s own magnum opus “Nine Feet Underground”. Disc Three is a DVD featuring the brand new 5.1 Surround Sound and Stereo mix of the album plus two performances recorded for German TV’s Beat Club in June 1971. “Golf Girl” was broadcast at the time but “Winter Wine” has never been seen. f. Honest I Did ! This entry was posted in CD, Merchandise, Music and tagged 40th Anniversary, Land of Grey and Pink on May 30, 2011 by caravan. 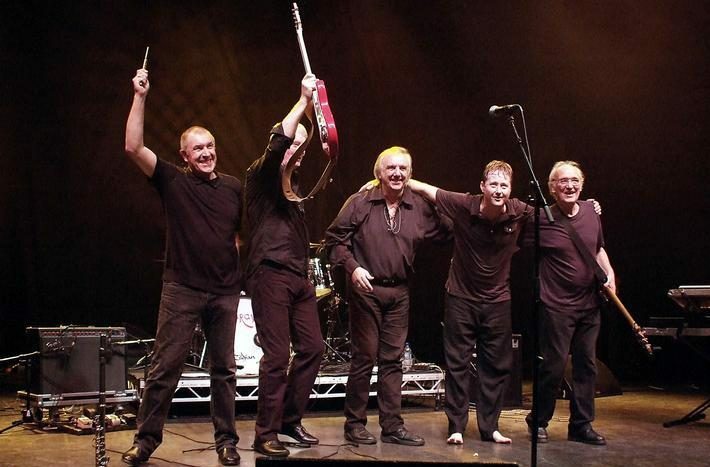 Caravan the legendary Canterbury band re-formed specially for this London studio concert in late 2010 and the audience each one of which was no further than ten feet from the band were rewarded with a review from Classic Rock which quoted “a new era dawns for the veteran band. They are going to have to go a long way to match this sublime performance”. Pye Hastings Geoffrey Richardson Jan Schelhaas Jim Leverton and Richard Coughlan are joined by new drummer Mark Walker. The concert set covered classics and new songs Fingers In The Till and I’m On My Way. The concert was filmed in 1080p HD but is presented in the highest quality standard definition format with LPCM Stereo and DTS 5.1 surround sound on the DVD. Release on the Bluray format is not expected. This entry was posted in DVD, Merchandise and tagged 2010, Legends concert on May 23, 2011 by caravan. Universal-Decca has today released the much anticipated 4CD Anthology box-set. The World is Yours is now available to purchase online at Amazon 7digital iTunes and also available for free streaming on Spotify. The World Is Yours – The Anthology 1968-1976 is an exhaustive remastered four CD box set from Canterbury sound band Caravan. The set includes previously unreleased studio recordings album tracks rare single mixes BBC recordings and out-takes a s well as a lavish book featuring an essay and previously unseen photographs plus sleeve notes by Mark Powell. Stream it for free on Spotify! This entry was posted in Merchandise, Music and tagged Anthology, The World Is Yours on March 22, 2010 by caravan.